Magento speed optimization service boosts your magento website speed significantly, as well as enhance search rankings, conversion rates, and magento performance. It allows to reduce operational costs, increase user engagement as well as improve magento speed test results. If your Magento speed is low, then you have come to the right place. As you probably know, Magento performance depends on many factors, but the most important are Magento optimized hosting and Magento cache. 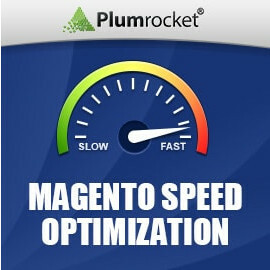 At Plumrocket, we have designed a 3-level magento performance optimization service that will help you speed up your Magento site to meet the current requirements. The 3 plans we offer allow you to choose the type of Magento speed optimization you feel is suitable for your particular business and budget. The only goal we set here is to help your business succeed. Why Do You Need to upgrade to PHP7 and How Does PHP 7 Affects Performance of Magento? PHP7 is almost as twice as fast as PHP5. However, default Magento 1.x installation does not support PHP7 out of the box. In addition to that, majority of third party magento 1.x extensions are not compatible with PHP7 as well. Different magento stores will require different amount of development to adapt and migrate the code to support PHP7. Please contact our tech support to receive your custom quote. Our tests showed following average page speed improvements per plan, "Startup": 30% faster (comparing with default magento installation), "Premium": 330% faster and "Professional": 1100% faster page load speed. Please note that all numbers are approximate and may vary depending on your server hardware, geo location and your previous magento store setup. Please see our magento performance speed testing results for more information about how "average page speed improvement" was calculated. We recommend you to test your magento site using http://www.webpagetest.org/ and http://www.magespeedtest.com/ tools before ordering our services. These tests will help you better understand your website speed and choose proper magento optimization service plan. Please do not hesitate to ask our support if you have any questions. Contact us Today if you wish to receive FREE Magento Performance Review & Server Diagnostics Report prior to purchasing any of the Magento speed optimization packages above. Get valuable tips from our Speed Optimization Experts to help you choose your perfect Magento Speed Optimization Service Plan. * Please note that all "Average Page Speed Improvement" numbers are approximate and may vary depending on your server hardware, geo location and your current magento store setup. Please see our magento performance speed testing results for more information about how “average page speed improvement” was calculated. Client may choose not to perform any number of the suggested procedures from each plan, however this will not change the plan price. Additionally, not all the procedures can be performed on all web servers. For instance, “Dedicated Database Server setup” requires separate db server to be purchased by client. SSL installation is not required as it is not helping to optimize the server but is still provided as part of “Premium” and “Professional” plans. Client must not change the site source code on the optimized server while Plumrocket Inc performs optimization service as this may influence the final results. Only one magento instance and one web server can be optimized with Startup speed optimization plans. Premium and Professional plans are limited to one domain / one web server only. Please contact our tech support for custom quote if you need to optimize more than one magento / domain / webserver / database server. Great Magento developers and support team! Husam posted on January 31, 2019. Thank you guys, I just can’t stand sharing what a great service you did. We optimized our clothes store containing around 50k items with this Magento service. We are glad that we bought the professional one, even though we were hesitating a lot. It made our website 20 TIMES faster. It is definitely worth of money we spent. Our clients are satisfied and we are glad to provide them with a quick service. Couldn’t be happier. Albert Gobuket posted on June 06, 2017. Absolutely the best solution. I've tried so many other solutions and finally came across this plan and it is so much faster than any other solutions that I've tried. Website got definitely much faster, great feedback from the tech support!!! Highly recommend optimisation from this company, the tech support is very knowledgeable, efficient and friendly!! Hendrik Jan Marinus Klomp posted on October 22, 2016. I have bought the speed optimization and plumrocket has done a great job with this service. They are still working on it but i can feel the difference with my website speed! Its already worth the money that i have spend! Furthermore they do what they promiss and i can recommended the service to everyone who wants a faster working website! Thanks Plumrocket for the great service! we have been extremely pleased with your expertise! James D. posted on May 26, 2016. You and your company and have been very responsive and truly got the job done. The site is running much faster and we hope to start seeing the rewards in increase conversion rates once we roll out our new marketing initiatives. I feel that we have acquired a great asset and partner in your company to support us with our highly technical ecommerce needs. Hongwang Du posted on May 19, 2016. Thank you very much for the work done. so far, our website is faster than before although we may need to switch a better server.. I can say the Plumrocket's service satisfy me and make me pretty happy. I believe my customers will be happy too. So far, they are still working on it. Thank you Plumrocket. I would recommend this service to anyone who thinks who could use an upgrade with their site speed. Our site is faster than I expected! Eun Kim posted on March 07, 2016. I can see significant changes on category pages. It saves around 2-4 seconds, specially Ajax filtering saves 5-7 seconds. It's worth to pay for it. Eyal Kattan posted on June 10, 2015. Overall I was pleased. We saw an increase in site speed, and you handled any problems that came up professionally and relatively promptly. There were a couple of frustrating moments, but, as I said all issues were eventually dealt with. My website is faster now! Xavier Botero posted on April 03, 2015. Thank you very much for the work done, you are the experts! – it went down from 22.25 seconds to 5.20 seconds (which is 327% faster than before the optimization). Furthermore, Google speed index improved by 82%, and load time by 227%. More visitors are allowed to browse the website without interruption since the number of failed transactions went down from “46” to “0”. Currently I'm more than happy with the optimization service provided! Brian Heying posted on March 24, 2015. I couldn't be more pleased with this service. I was experiencing severe load times with some extensions I had running that were causing some pages to take minutes to load and other pages would time out entirely. Not only did Plumrocket complete this service, they recognized other areas of concern and provided additional recommendations to further optimize my site. I can now say it is significantly quicker and I've experienced lower bounce rates and higher conversion rates from it.